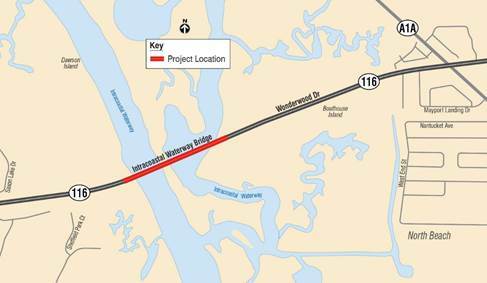 Repairs and rehabilitation of the Wonderwood Drive (State Road 116) bridge over the Intracoastal Waterway began the week of October 23, 2017. Rehabilitation of the bridge includes superstructure beam repairs and corrosion protection. The work is taking place under the bridge deck below the eastbound and westbound spans of the bridge. Crews will perform most of the work on platforms suspended under the bridge. Eastbound lane closures will occur on the bridge during the first several weeks of construction to allow for the attachment of the work platform. No lane closures are allowed from 6 a.m. to 8 a.m. or from 4 p.m. to 6 p.m. After the platform is attached, lane closures on the bridge would be intermittent, if needed, and would not be scheduled during peak traffic times or on holidays or special events. M & J Construction of Pinellas County is the contractor for FDOT’s $2.7 million project. It is scheduled for completion, weather or unforeseen circumstances permitting, in summer 2019.